Local favourite Johnie Berntsson and his Berntsson Sailing Team took full advantage of the champagne sailing conditions in Marstrand today with six wins out of seven races in Qualifying at Stena Match Cup Sweden, the third World Championship Event of the 2015 World Match Racing Tour. Berntsson joins Ian Williams and Keith Swinton with seven points at the top of the leaderboard. 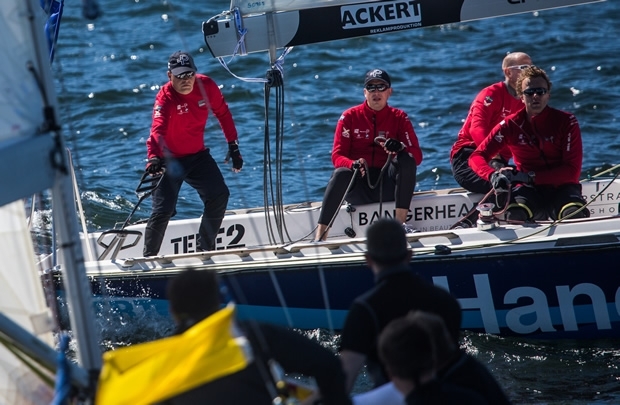 Defending event champion Bjorn Hansen and his Nautiksa Racing team lies in fourth position with six points. “It was a great race [against Canfield] from start to finish and we held the advantage the whole way. With our two wins today we now have a good shot at reaching the Quarter Finals and that’s what we are aiming at.” said Dackhammar. Racing resumes tomorrow at 1300 after a morning of Pro-Am racing where VIP’s and sponsors get to experience what it’s like to sail with professional teams. The forecast is for sunshine and light winds from the southwest, which will test the skills of sailors and race management alike.